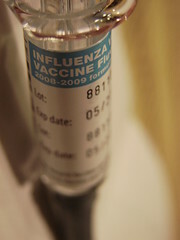 Is this the vaccine standing between you and two weeks of misery later this winter? Photo by IamSAM -- thanks! If anyone knows of flu shot clinics available up here on top of the Hill (Red Apple, maybe? ), please let us know and we’ll add the info to this post.